Do you prefer travel destinations that take you off the beaten path? Do you spend your vacations away from the traditional hotel infrastructure, communing with nature during the day and living as the locals do by night? If so, you are an adventure traveler. You aren’t alone; adventure travel is one of the fastest growing segments of the travel industry. What’s your favorite adventure travel destination? Finding your ideal adventure travel experience is easier now than ever because you can choose your own level of comfort and safety. Would you rather rough it during the day — and sleep in comfort at night? No problem; new boutique hotels regularly appear near the most popular overseas adventure travel destinations. Would you prefer to travel in a group setting with an experienced leader? Adventure travel companions are easier than ever to find. Strap yourself in — it’s time to go on an adventure. These are the greatest overseas adventure travel destinations. Nestled on the banks of the Orinoco river, the fastest growing city in Venezuela is home to more than 1 million people and is one of the gateways to Angel Falls. Boasting some of the top universities in South America, Ciudad Guayana is an area of relative affluence. Although Venezuela is presently a nation of extreme turmoil, those willing to brave the journey will discover natural rewards beyond measure. With a height of over 3,200 feet, Angel Falls is the world’s tallest waterfall. The waterfall was named after U.S. aviator Jimmie Angel, who first flew over the site in 1938. Angel so loved the site that he had his ashes scattered there after his death in 1960. Angel Falls is located within Canaima National Park. Taking a flight from Ciudad Guyana is one of the easiest ways to reach the Canaima village on the outskirts of the park. Plan to pay about $140 per person for the flight. Traveling to Venezuela isn’t cheap, but ample accommodations in Ciudad Guayana have created a competitive environment in which even luxury hotels are quite affordable. With rates starting at around $116 per night, it’s hard to beat the Hotel Plaza Meru. The hotel’s recently renovated rooms include soft beds, flat-screen TVs, safes and spa-inspired bathrooms with walk-in showers. Hotel Plaza Meru has a modern gym, in-room dining and three restaurants. Before you depart for Canaima, grab lunch at La Posada de Chiquito. Famous for its tapas and other upscale Spanish fare, La Posada de Chiquito is clean, cozy and professional. Try the local seafood dishes, or snack on a tortilla stuffed with creamy manchego cheese. Although Angel Falls is certainly the most spectacular waterfall near Ciudad Guyana, it isn’t the only one. Llovizna and Cachamay parks — both located within the city limits — also boast beautiful waterfalls of their own. Ciudad Guyana receives some of its electricity from the Macagua Dam. The Macagua Dam is more than 11,000 feet long and generates over 3,100 megawatts of electricity. At the dam, you’ll find the free Caroni Ecomuseum. The museum includes an art gallery and exhibits chronicling the dam’s construction. It also houses artifacts dating from before the Spanish conquest of Venezuela. If you want to visit an overseas adventure travel destination that allows you to get up close and personal with real South African wildlife, Phalaborwa is the destination that you want to visit. The massive Kruger National Park has a total area of more than 7,500 square miles, and several cities in South Africa have gates near the park. However, Phalaborwa is the only city located directly on the park’s border. Kruger National Park is among the largest wildlife preserves in the continent of Africa. It is home to thousands of rhinoceroses, zebras, cheetahs, giraffes, elephants, leopards, lions and more. The park is so enormous that just traveling between the northern and southern extremes would take several hours. Thankfully, Kruger National Park has several private lodges and spas for those who’d prefer not to camp. You’ll want to stay in Phalaborwa for at least a night or two before venturing further into the park. Try the Aha Sefapane Lodge. With rates starting around $90 per night, the Aha Sefapane Lodge is an affordable hotel that doesn’t skimp on comfort. The hotel features both houses and rondavels — many of which include air conditioning. You can choose from a number of guided activities during your stay. The available activities include safaris, village tours and bicycle treks. While staying in Phalaborwa, stop at the Bushveld Terrace hotel for dinner. Although some diners have commented that the restaurant’s prices are a little high, no one has anything negative to say about the restaurant’s perfectly cooked steaks and extensive wine selection. You should also take the time to visit the Foskor Mine Museum on Koper Street. The museum provides insight into a local mining tradition with thousands of years of history. With a reported 220 different activities, Queenstown, New Zealand might be the greatest overseas adventure travel destination in the world. In Queenstown, you can experience summer and winter activities in the same day. You can visit the world’s first permanent commercial bungee jumping site. You can visit the filming locations of some of your favorite movies. Most importantly, you can do all of it with extremely plush nighttime accommodations. Queenstown is one of the world’s top tourism destinations. If you love to get an adrenaline rush during the day and relax in opulence at night, Queenstown is the place for you. If you want to go bungee jumping in New Zealand, the first thing you need to know is that New Zealanders spell it “bungy.” No matter how you spell it, the one thing that any adventure traveler must do in Queenstown is visit the Kawarau Gorge Suspension Bridge. It’s the first location of the AJ Hackett Bungy company and the world’s oldest commercial bungee jumping site. Since the site’s founding in 1988, more than 2 million people have taken the plunge into the Kawarau river more than 140 feet below. The jump costs $195 NZ per adult. Queenstown has a mature tourism infrastructure with accommodations available for all tastes and budgets. If your budget leans toward the more extravagant, you have to rent a private villa at Azur. With prices starting at $1,200 NZ per night during the off-peak winter season, each of Azur’s nine villas features more than 250 square feet of living space. While staying in the villa, you’ll enjoy complimentary afternoon tea, drinks and appetizers before dinner and evening turndown service. Enjoy dinner in your villa followed by a relaxing massage, or visit the main lodge building to eat in the scenic outdoor dining area. Staying at Azur is an experience you won’t forget. While staying in Queenstown, forgo dining in your villa one evening and head downtown to eat at Rata. Though it is one of Queenstown’s more expensive restaurants, Rata’s intriguing combination of European fine dining and local New Zealand fare has earned the eatery great fame. Rata’s Southland cheese roll is a unique take on a classic New Zealand snack. Diners also rave about the beef Wellington. For a dedicated adventure traveler, running out of things to do while in Queenstown is virtually impossible. 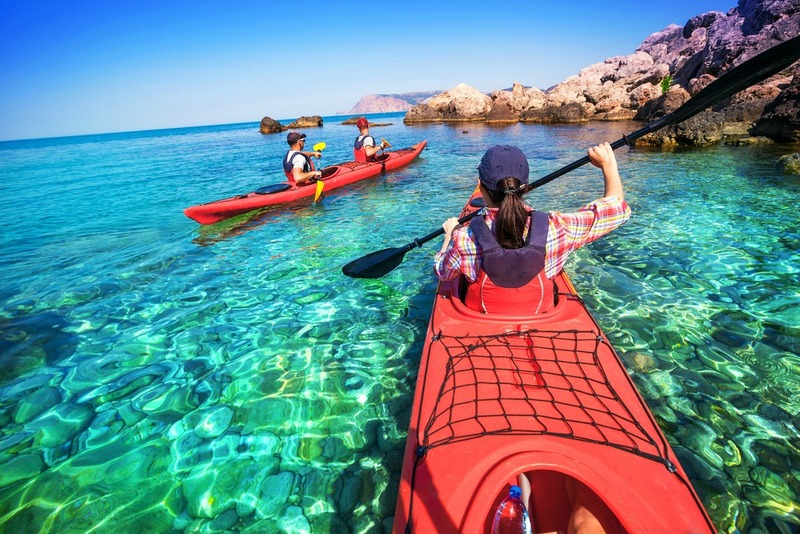 Depending on when you visit, some of the available activities include hang gliding, skydiving, rafting, parasailing, ziplining, skiing, off-road driving and more. You may even find the time for a round of golf. And if you are in New Zealand of course Queenstown isn’t the only spot to catch some adventure. Check out this complete New Zealand adventure travel itinerary. Istanbul is home to more than 14 million people, one of the world’s oldest cities and among the world’s most popular overseas adventure travel destinations. During the time of the Roman empire, Istanbul already had hundreds of thousands of residents. Today, the city is a striking mix of the new and the old. You’ll find world-class museums, jaw-dropping architecture, key religious sites and much more in Istanbul. While you could fly directly to Istanbul, you can make the trip a once-in-a-lifetime event if you begin your journey in Paris. Board the Orient Express — lovingly restored to its original 20th century grandeur — for a six-day journey you’ll never forget. Riding the Orient Express from Paris to Istanbul costs about £7,000 per person. During the trip, you’ll also stop in Budapest and Bucharest to enjoy luxury hotel accommodations. What’s the reason for an adventure traveler to make the journey to Istanbul? View some of the world’s most spectacular rock formations from the air during a balloon journey from Istanbul to Cappadocia. The journey lasts a little over an hour and costs about €250 per person. If you’ve never experienced the wonderful silence of balloon travel, you couldn’t ask for a better setting than the incredible Fairy Chimneys. With more than 800 hotels, Istanbul has accommodations to suit all tastes. For our money, though, you can’t go wrong with the Ciragan Palace Kempinski. At around $300 per night, the Ciragan Palace features a gorgeous garden and pool overlooking the Bosphorus. Enjoy the incredible views and classic Turkish decor by day. At night, dine in one of the hotel’s seven restaurants. When you need a break from standard hotel fare, visit Topaz restaurant for a lovely evening view of the Istanbul skyline and a sampling of Turkey’s boldest modern cuisine. Try the truffle risotto with salted beef. If you prefer seafood, you’ll love the grilled sea bass served with a fondant of pumpkin and ginger. Our pick for dessert is the chocolate velvet cake with gold leaf, vanilla cream and ginger fruit jelly. Although it’s an adventure more for the mind and spirit than the body, you must make the time to visit Hagia Sophia before leaving Istanbul. Hagia Sophia began life as a Christian church during the time of Roman emperor Constantius II. After changing hands several times over the centuries, Hagia Sophia settled into its current museum role in 1935. Visiting the museum, you’ll enjoy artwork spanning hundreds of years in one of the most dramatic settings you could possibly imagine. The island of Hokkaido is one of Japan’s most popular destinations for tourism. During the summer months, the temperature on Hokkaido seldom exceeds 72 degrees Fahrenheit. It’s the perfect location for an escape from the heat during the summer or a skiing trip during the winter. With a population of nearly 1.9 million people, Sapporo is Hokkaido’s largest city. Outside Sapporo, though, Hokkaido is a naturalist’s paradise. Hokkaido boasts six national parks and five quasi-national parks. Although Hokkaido does have an airport, you can begin your adventure in Tokyo instead if you like. Take the Hokkaido Shinkansen from Tokyo to Shin-Hakodate-Hokuto Station in southern Hokkaido at a cost of about $200 per person. The bullet train reaches 160 mph and travels 513 miles in a little over four hours. Mt. Asahi in Daisetsuzan National Park — the tallest peak in Hokkaido at over 7,500 feet — is a favorite destination for hikers from around the world. Visit during the summer to avoid the cold, rainy weather that floods the hiking trail during the winter. The well marked trail will take you to the top of Mt. Asahi in around four hours, but you can reduce the hiking time by taking a gondola from the base of the mountain to the main trailhead. During the hike, you’ll view volcanic steam vents and colorful local flora. Look out for bears. When you visit Hokkaido, your best best is to stay at a ryokan. Our pick is Hanayura in Noboribetsu. With rates starting at about $500 per night, Hanayura is one of Japan’s top luxury hot springs resorts. Relax in one of the resort’s two naturally heated sulfuric public baths, or take a dip in your own private bath fed directly by the hot spring. The resort’s restaurant serves delightfully presented local seafood and produce with a menu that varies by season. Sobadokorofukuan is one of the most popular restaurants for lunch in Noboribetsu. Order the cold soba noodles — still made by hand according to the traditional Japanese method — with a side of prawn tempura. Though Sobadokorofukuan also offers hot soba noodle soup, eating the delicate buckwheat noodles cold is the best way to enjoy their texture. Lake Shikotsu — not far from Daisetsuzan National Park — is one of the loveliest spots in Hokkaido. You must visit the lake for the Ice Festival during the winter. Local artists use the lake’s frigid water to create ice sculptures. By night, the sculptures are illuminated with colorful lights to create an unforgettable scene. Visiting Laitkynsew gives you an opportunity to see the remarkable living root bridges — one of which is over 150 feet long. The living root bridges are actually roots of local rubber trees. Betel nut trunks support the bridges until the roots can support their own weight. Since the roots continue to grow and become stronger as long as the trees live, the bridges can theoretically last hundreds of years. Stop by the nearby Nohkalikai Falls to see India’s tallest plunge waterfall. The waterfall descends into a green pool from a height of over 1,100 feet. Laitkynsew provides the perfect gateway to Mawsmai, a lit limestone cave with spectacular rock formations. If you look closely, you might see sculptures of people, animals and more — but the formations are actually entirely natural. You may also see cave dwellers such as bats, centipedes and crayfish. Although the cave receives natural sunlight only through the entrance, electric lights inside the cave will help you find your way. Laitkynsew features only one hotel: the Cherrapunjee Holiday Resort. A stay of three days and two nights costs about $100 per person. The hotel features clean, small rooms with tasteful decor, wireless Internet access, a library and evening activities such as bonfires and performances by local musicians. The Cherrapunjee Holiday Resort caters happily to vegetarians, preparing vegetarian and non-vegetarian food in different kitchens. The menu features a delightful mix of Indian and Chinese cuisine. If you enjoy the vegetarian menu at Cherrapunjee Holiday Resort, visit nearby Orange Roots to enjoy a light lunch. Orange Roots serves traditional vegetarian snacks including dosa, puri, pakora and tea in a lovely setting replete with lush greenery. When you desire a change of pace from the local natural wonders, take an afternoon to visit the Ramakrishna Mission. At the mission, you’ll find a museum boasting a collection of tribal artifacts and antique music recordings. Although Wales is legendary for its many natural charms, Blaenau Ffestiniog is something different. Once a major center for the slate mining industry, Blaenau Ffestiniog has survived since the industry’s decline by inviting tourists to come and explore the abandoned quarries. You can get there by taking a train from Manchester. The journey lasts a little under four hours and costs about £38. Zip World Caverns is the latest attraction that’s causing people to flock to Blaenau Ffestiniog. It’s the world’s largest underground zipline. The adventure costs £60 per person and lasts around three hours. The course features 10 ziplines, rope bridges, tightropes and more. Colored LED lighting sets the stage for a dramatic underground adventure. The Oakeley Arms is a charming hotel a short drive away from Zip World Caverns. Rooms begin at just £65 per night and include coffee, tea, chocolates, bottled water, luxury linens, toiletries, a flat-screen TV and more. The Oakeley Arms has an on-site bar serving breakfast, lunch, dinner and drinks. Try the artisan cheese platter. It features local Welsh cheeses, house-made chutney, a Welsh fruit cake and plenty of crackers. The most popular place for breakfast in Blaenau Ffestiniog is De Niro’s. Stop by for a full Welsh breakfast including eggs, sausage, ham, beans, hash browns and a tomato. De Niro’s also caters happily to vegetarians. The slate caverns in Blaenau Ffestiniog aren’t just the home of Zip World; they also provide an opportunity to learn more about what life was like for miners in the Victorian era. You can explore the slate caverns with the help of a guide and even learn how to split slate yourself. Obviously our list is somewhat subjective, so we’d love to hear what you think…what do you think is the ultimate adventure travel destination? We’d love to hear your stories in the comments below.